Hello everyone! What a crazy week; I moved and started my internship! So far, so good and I am really excited to see what the next 10 months hold :). Now onto the food…..have I mentioned that I love pasta? Growing up, being the picky girl that I am, I would always eat pasta with butter and parmesan cheese. In college this dish continued to be my go to. I have gotten better over the years with trying new foods, but I noticed something this week. Almost everyday last week I ate pasta for dinner….I did add tomatoes to it but it was still pasta. I decided that this week I would try new things! So, I researched on Pinterest and I have some up-and-coming new recipes/blog posts. 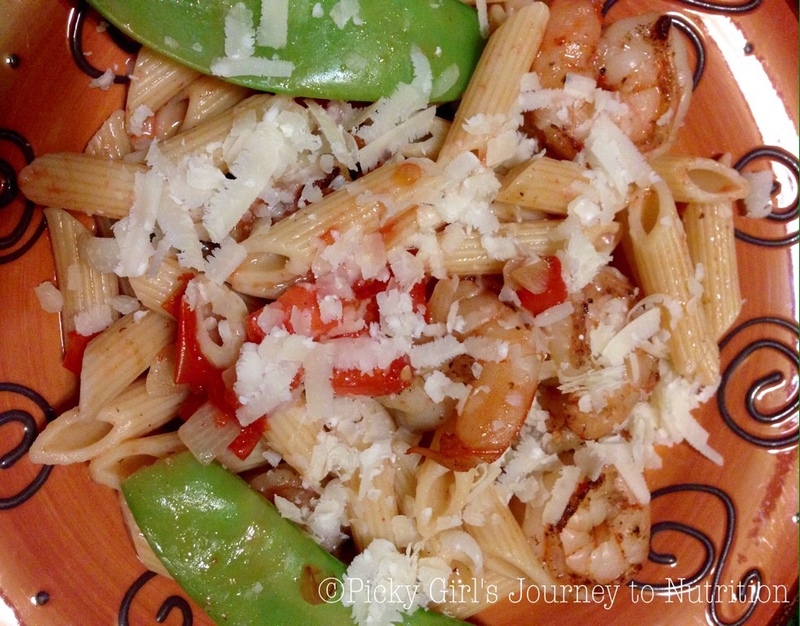 But, for now here’s a new pasta recipe, one that isn’t just butter and parmesan cheese. Peel shrimp and snow peas. Start cooking pasta (follow box directions). **Save 1/2 cup of pasta water. Sauté all ingredients (except tomato) in olive oil, in this order: snow peas, then onions and garlic together. Combine all ingredients together after done sautéing. Sauté shrimp in olive oil until fully cooked, they should be lightly pink. Put all ingredients in the sauté pan, including tomatoes, then add pasta. Add 1/2 cup of pasta water. Serve and top with parmesan cheese of course ;). I hope that you enjoy this recipe and stay tuned for more yummy ones!